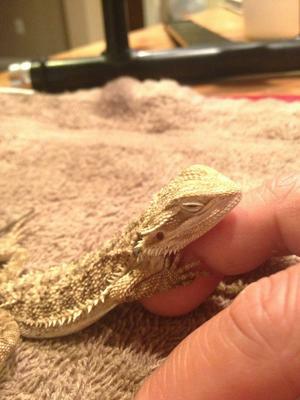 We just recently acquired a bearded dragon. It was gift and am completely uneducated about caring for a reptile. I have many questions all suggestions and advice are very much appreciated! #1. my bearded dragon does not eat much protein. Maybe a meal worm once every 3 days? He is very little and very inactive. I have seen videos on line & he is not nearly as active as the videos we have seen. I am scared that he is sick? He does move occasionally but definitely not one to "run" around his tank. He is move from one side to another and also sit in his water dish at times, but is that because he is used to his home already? #2. We have had SO many different opinions on what to feed him. He definitely will eat some of his veggies, we give him collard greens but he will only eat one small leaf at a time, he also will eat a very small portion of a blueberry. But after that he doesn't want to eat any more. I am assuming because he is baby? #3. I feel that we are not giving him enough heat? We have a "Repti Spot Lamp" by zoomed 50w UVA on top along with a heat rock. The lady at PetCo said to only use the heat lamp during the day and the rock at night? But I read that heat rocks can burn him? We have heard SoOo many different suggestions, we love him very much and just want to provide the best care and environment for our new beardie! Please, Please help! Again all suggestions and advice are very much appreciated! Thank you for reading! heaters because beardies have trouble sensing heat from below thier bodies. 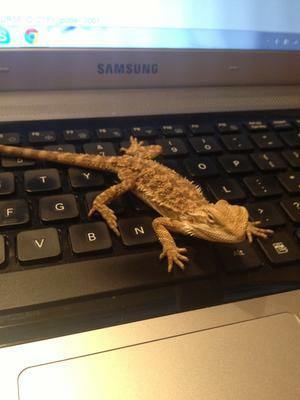 Comments for My bearded dragon is very inactive and we are SOoo in love with him! your lizard will bathe in its drinking water mine does that too.